Genesal Energy continues to consolidate its standing in central America with a specially designed genset for Panamanian television. 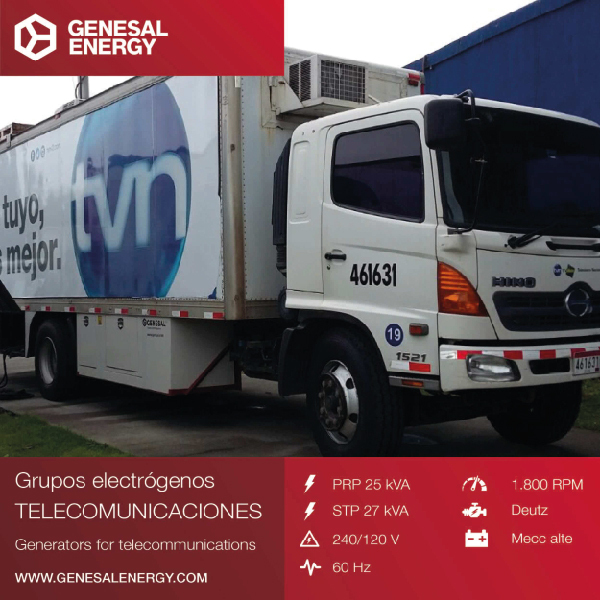 Panama National Television (TVN), one of central Americas most important, has put their trust in to GENESAL ENERGY by asking us to design a super-compact electrical generator, adapted to their energy demands. 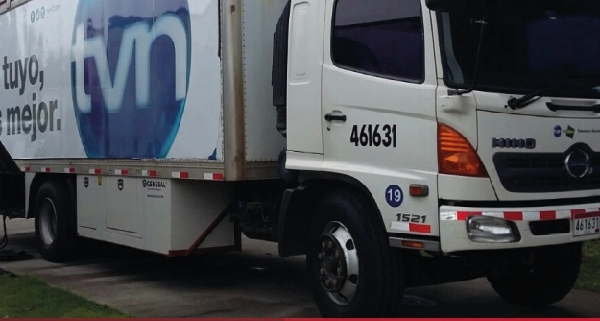 Having the ability to transmit their signal problem free from anywhere within the country of Panama, led TVN to realise and understand the importance of a genset that can supply energy to all of their field equipment. Whether it is to ensure an interview goes off without interruption, or a live connection remains live, TVN have chosen Genesal Energy to help them reach their large central American audience. A fundamental part of the project was the ability to attach and suspend the genset to their mobile transmission trailer. For this reason alone, it was clear that a highly robust, super compact genset was required to be able to resist various situations, such as poor roads, inclement weather, stone or mud spatter when travelling etc. This was a clear case of designing a personalised genset, a speciality of GENESAL ENERGY. A key part of the GENESAL ENERGY solution was to design a genset which was very compact (2286x758x752mm) to fit correctly to the chassis of the TV truck. A 50-litre fuel tank was integrated in to the solution, and removable panels have been added for ease of access for maintenance and servicing. Additionally, inlet pipes and outlet pipes were designed to be compatible with the movement of the trailer, taking in to account the direction it is travelling, and ensuring the genset is not at risk of damage. The genset control unit is remote, and has also been designed by Genesal Energy. It contains all the functions required, alarms and the necessary protections as requested by the client, for safe supply of electricity to their connected apparatus (cameras, microphones, lighting etc). Another key area requiring a prioritised solution was related to the noise emitted by a genset in operation, which can cause interference when the TV crew are recording material. The solution; we designed a soundproofed canopy using noise absorbing material, capable of reducing noise emission from the genset to levels sufficiently within those that are required for TVN to produce their audio-visual requirements. The project has been successfully completed and most importantly delivered. 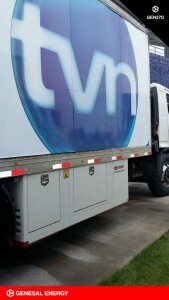 Installation and commissioning was also supervised by our on-site team, and TVN now has a TV truck with the freedom to operate where the news is happening. https://genesalenergy.com/wp-content/uploads/2017/11/genesal-energy-grupo-electrogeno-television-panameña-1.jpg 600 600 genesal https://genesalenergy.com/wp-content/uploads/2017/11/genesalenergy-logo.png genesal2017-11-06 08:08:512019-03-04 13:28:49Genesal Energy continues to consolidate its standing in central America with a specially designed genset for Panamanian television.